DOHA, Qatar, 2017-Mar-29 — /Travel PR News/ — Qatar Airways’ participated in the Qatar-UK Business and Investment Forum taking place in both London and Birmingham this week under the patronage of Qatar’s Prime Minister and Minister of Interior, His Excellency Sheikh Abdullah Bin Nasser Bin Khalifa Al Thani. This significant event included a roundtable meeting with UK Prime Minister Ms. Theresa May and was attended by senior Qatar and UK political representatives such as the UK’s Secretary of State for International Trade, Dr. Liam Fox and Qatar’s Minister of Transport and Communication, His Excellency Mr. Jassim Saif Ahmed Al Sulaiti and Minister of Finance, His Excellency Mr. Ali Shareef Al Emadi. The forum also featured an impressive gala dinner attended by His Royal Highness Prince Edward, the Earl of Wessex and his wife, Her Royal Highness the Countess of Wessex. H.E. Mr. Al Baker spoke at a panel discussion on the first day of the forum, commenting on the leading role that aviation plays in the expanding business landscape relationship between the two countries. H.E Mr. Al Baker spoke alongside other leading speakers such as H.E. Dr. Hanan Al Kuwari, Minister of Public Health and H.E. Dr. Hassan Al Darhem, President, Qatar University. Qatar Airways works with many British companies such as Rolls Royce contributing to both investment and employment opportunities. During this high profile appearance to the delegation, H.E. Mr. Al Baker hinted towards a further commitment to the UK economy with a potential expansion to two new UK destinations. The two day Forum, which took place 27 to 28 March across both London and Birmingham, provided a significant platform to develop the trade and investment relationships between Qatar and the UK, while raising the profile of the strong relationships that exist between the two countries. The event showcases the best of UK industry in key sectors of mutual interest, such as healthcare, cyber security, education, finance and global sports – all areas of UK expertise that support the Qatari 2030 National Vision. There are twenty thousand UK citizens who live in the State of Qatar and forty thousand who visit the country annually from the UK, and Qatar Airways is proud to provide a modern and efficient transport infrastructure, with a fleet of the world’s latest generation aircraft and one of the most modern airports in the world, Hamad International Airport. The forum included an invitation for H.E. Mr. Al Baker to attend a VIP round table discussion with UK Prime Minister Ms. Theresa May on the importance of the UK-Qatar relationship, alongside key representatives from Qatar itself including H.E Sheikh Abdullah Bin Nasser Bin Khalifa Al-Thani, Prime Minister and Minister of Interior to the State of Qatar, while H.E. Mr. Al Baker also held a private meeting with Secretary of State for International Trade for the United Kingdom, Dr. Liam Fox. 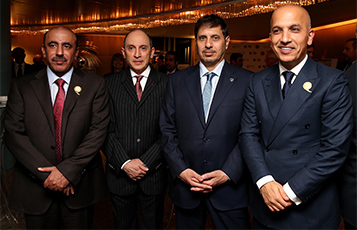 That same evening, Qatar Airways hosted a gala dinner at London’s Dorchester Hotel for more than 450 VIP guests, including notable dignitaries such as H.E Sheikh Abdullah Bin Nasser Bin Khalifa Al-Thani, Prime Minister and Minister of Interior to the State of Qatar. At the dinner, held in celebration of Qatar Airways ties with the UK, to which it has this month proudly served London Heathrow for 20 years, H.E. Mr. Al Baker also had the opportunity to greet with Her Royal Highness the Countess of Wessex, who sharea mutual interest in the UK based Orbis Flying Eye Hospital, of which H.E. Mr. Al Baker was patron to a visit by the Orbis aircraft to Doha just last week. Qatar Airways, the national carrier of the State of Qatar, this year celebrates 20 years of Going Places Together with travellers across its more than 150 business and leisure destinations. The world’s fast growing airline will continue to add a number of exciting new destinations to its growing network in 2017, including Chiang Mai, Dublin, Nice, Skopje and many more, flying passengers on board its modern fleet of 195 aircraft. Qatar Airways Cargo, the world’s third largest cargo carrier, serves more than 50 exclusive freighter destinations worldwide via its Doha hub and also delivers freight to more than 150 key business and leisure destinations globally on 195 aircraft. The Qatar Airways Cargo fleet now includes eight Airbus 330Fs, 12 Boeing 777 freighters and one Boeing 747 freighter. This entry was posted in Airlines, Business, Travel, Travel Management and tagged Qatar Airways, Qatar-UK Business and Investment Forum. Bookmark the permalink.